We met with Nicole Lee, founder of Warrior Moms, single mother of three, and beauty entrepreneur. Here is a woman who’s not afraid to be proud of a life well lived. Over coffee at Pleasant Ridge’s Coffee Exchange, her words are as sassy as her smile. Interview by Kiersten Wones. Photography by Chelsie Walter. My name is Nicole Lee. I’m an author, entrepreneur, a successful business owner, and a consultant. I’ve been in the hair and beauty industry for 20 years. That’s been my pride; I’ve been very successful at it. I went to college for a year and didn’t like it, but I didn’t like being poor. I always had this hustle mentality. My parents said, “You gotta do something” so I was like, “I’ll go to work and go to school part-time.” I always had a knack for hair. I had a clientele when I was in high school, so it was something that came naturally to me. I said, “I’ll get my license and if it doesn’t work, I’ll go back to college.” I gave myself about six months. My clientele picked up. It was booming and I was like, “Hey, what’s wrong with this?” And here we are 20 years later. My first salon was in Golf Manor; it was a partnership. When I was married and had my children and I was in the home, I still had a few clients. I went through a divorce and moved up to West Chester and opened up my third salon. So even with life’s struggles, there was always a victory that was attached to it that was tied to my ability to actually do hair and be able to counsel people. Success and entrepreneurship and motherhood, they came naturally to me, so I just held onto those things that I was good at and just rode it out. What exactly do you mean when you say “counsel people”? That’s what hair stylists are: We’re counselors. You’re sitting in our chair and we’re sharing everything. There’s something about that trust factor. I believe it has a lot to do with the touch. That’s why I wrote my book after I retired from the industry called Healing Cosmetologist. I shared my experiences with my customer base and my success within the business. It’s a how-to book: how to be successful in the industry. I also talk about the energy exchange that’s happening to a stylist and her customer. It’s a beautiful thing, and I wanted to share with the world how much of an influence we are as stylists. We have the power to really assist and help with somebody’s life and purpose. I have three children. They’re 15, 17, and 23. They keep my foundation, my base, stable even with life’s journeys. They keep me focused. That’s just a blessing. My son is in college at Xavier in sports marketing. My daughter will be graduating and she’s attending Tennessee State. And then I’ll have my 15-year-old; he’ll be a junior next year. So I’m at that stage where it’s an empty-nester type of deal. I’m excited; it’s all about me now. I’m going to write and travel and enjoy it. What were some of the struggles you’ve faced as a single mother? I was married, and we weren’t compatible, but God decided to bless us with children. I really started pouring into my children, and that alone is a struggle because as a baby comes, it’s not all about you. [It’s a struggle] to be able to put yourself in a place of being unselfish, [to say] “I need to put my focus there and put me aside, just for a moment.” Not totally. I definitely don’t agree with that. We had our struggles where our gas and electric was off. I’ve been there where we had to go get assistance. There were other situations. I had to make the decision to close my salon down to totally concentrate on my children’s education. Where we lived in West Chester, the school system wasn’t giving us what we needed. I had to put me aside. The struggles are different; it’s not always monetary. It’s how you make life choices, totally putting you and your dreams on the back burner. I have a lot of ideas and dreams and aspirations, but I’m realizing the priorities allowed me to be able to go for Warrior Moms. That’s pretty much my prize for the work I’ve done. I finally get my turn. Tell us about Warrior Moms. Warrior Moms is a project funded through People’s Liberty. I’m offering a makeover/photo shoot for a single mother in three neighborhoods: Avondale, North College Hill, and Price Hill. The goal is to awaken and celebrate and give the single mother that we choose tools to help her continue the work of being a single mother. We’re there to give them support and applaud them, ’cause they’re raising our future leaders. Not only are we going to do the makeover/photo shoot; we’re doing an actual workshop coming up in May once we choose the winners. We’re also going to invite the other mothers that applied. We’re going to give them some tools to help them to relax. They’re stressed. And I’m going based off my own experience. So we’ll give them some meditation, ideas to do yoga –tools they can take home where they don’t have to pay for something. There’s a young lady, Emerald Sparks, who’s offering her financial literacy services for free for the three mothers. She’s going to give them counseling and help them with their credit scores and their spending. That’s a major, major thing. We’re giving a little class on first impressions, as well. Single mothers: You’re tired, but you still gotta put some kind of care in self, so put on a little lip gloss. It lifts you up. The [photoshoot] is gonna be fun, exciting, with music and food; they’re getting pampered and dolled [up]. They’re gonna get the nails, makeup, hair, clothing design, and jewelry. We’re gonna take pictures. The whole idea is to take a picture of her everyday look while she’s looking at her warrior self. It’s gonna be amazing. We’re gonna invite her friends and family and her support team while they’re applauding her. That’s gonna be at the Kennedy Heights Art Center. At the finale, we’re gonna take the picture and frame it and gift it to her so it can be a reminder when she’s having those moments. That’s going to be at People’s Liberty, like an art gallery with wine and cheese and hopefully I can pull off bringing in a jazz band. When did the idea for Warrior Moms start? What were those first steps like? I retired after 20 years. My children were getting older and they needed me on a different level – mentally and spiritually – so I had to make a decision about my future. I retired from the salon, and soon after, my mom asked to come live with her because she knew I needed more support. Everything happens for a reason, I realized later. Children bring life to a household, and I was able to take a pause. My parents gained closer relationships with their grandkids and my children gained wisdom. So there was this whole transition in my life. For five years, I wrote. I have 10 books yet to be published. It gave me time to reinvent myself. While that was happening, I was working part-time, doing some consulting work with salons, writing my book, and I started doing some volunteer work to give back. AmeriCorps came and I started doing that with Santa Maria Community Services. While I was there, People’s Liberty came up, and I realized that was my reason for being there, as well as sharing in the community and offering what positive influence I could. I met with the advisor, Eric. I had three ideas. We sat down to help me structure which one the jurors would say yes to. During our conversations, he was asking me about my background, and he just held his head and was like, “I don’t know how single mothers do it,” and that was the first spark. That’s how creating a platform for single mothers to celebrate their strength evolved. The second meeting with the advisors was with Aurore. She loved the idea and she gave me the name Warrior Moms. People’s Liberty connected me with great advisors to take it to the next level and get me some structure, like “Which single mothers are you going to choose?” I hadn’t thought about that. [I also worked with Ryan Mulligan.] He’s part of Cradle Cincinnati and he gave me some direction. He gave me some facts about Cincinnati being highest rated in infant mortality. Poverty is pretty connected to the single mother household. That’s how I shrunk it down; I broke it down into three communities. I chose North College Hill, Avondale, and Price Hill because of my experiences there: Price Hill with AmeriCorps. North College Hill, that’s where my family’s from. Avondale, I had a connection to because I’m an empath, so I can sense people and what their needs are, what their gifts are. I would drive through Avondale and you could just feel the pain and hopelessness of the people there. What are the future plans and possibilities for Warrior Moms? There’s so many things that could happen. Writing being my passion, I want to utilize it that way. I’m writing the book of the journey and then I’m sharing the story via video. The idea is to take the video to the communities of the mothers that won, and she becomes a spokesperson of everything that she’s been given. We pour into her; now she pours into her community. I’ll go to all the neighborhoods and show the documentary and probably do a panel discussion. And I thought about Warrior Moms become an ecommerce site. Want to learn more about Warrior Moms? Meet Nicole’s team of beauty experts, designers, and workshop leaders here. 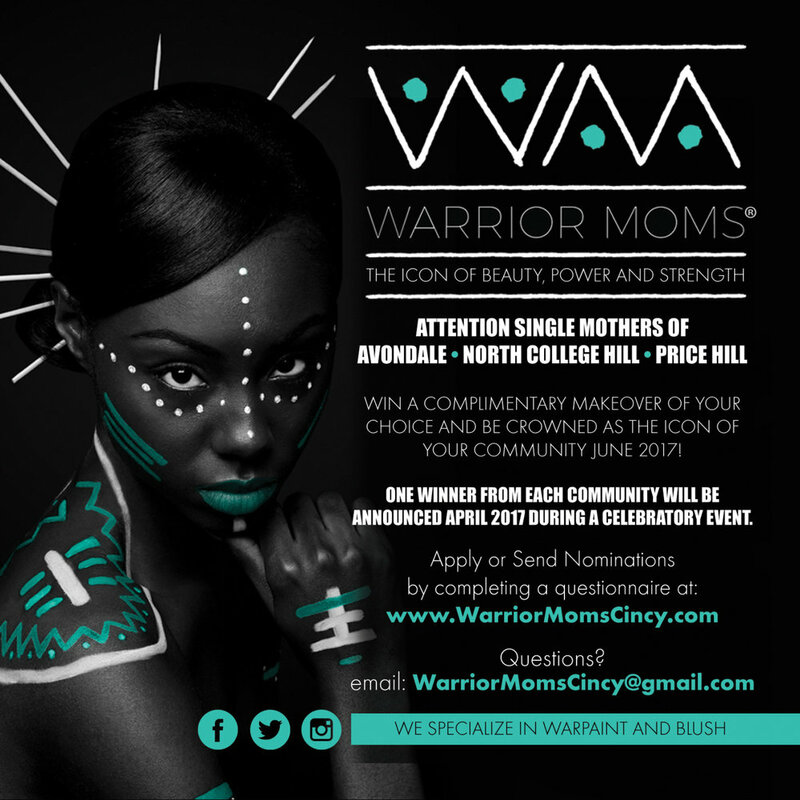 Applications to become one of the three Warrior Moms can be found here. Applications will be accepted through March 31. Winners will be announced April 8.